Fanconi anemia is a rare disease passed down through families (inherited) that mainly affects the bone marrow. It results in decreased production of all types of blood cells. This is the most common inherited form of aplastic anemia. Fanconi anemia is different from Fanconi syndrome, a rare kidney disorder. Fanconi anemia is due to an abnormal gene that damages cells, which keeps them from repairing damaged DNA. To inherit Fanconi anemia, a person must get one copy of the abnormal gene from each parent. The condition is most often diagnosed in children between 3 and 14 years old. 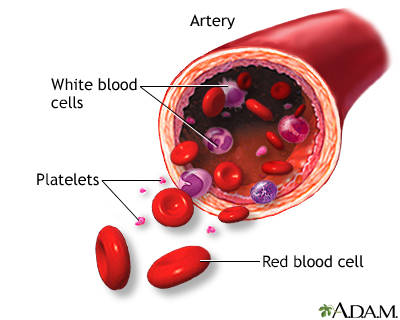 People with Fanconi anemia have lower-than-normal numbers of white blood cells, red blood cells, and platelets (cells that help the blood clot). People with mild to moderate blood cell changes who do not need a transfusion may only need regular check-ups and blood count checks. The health care provider will closely monitor the person for other cancers. These may include leukemia or cancers of the head, neck, or urinary system. People who have had a successful bone marrow transplant still need regular check-ups because of the risk for additional cancers. Hormone therapy combined with low doses of steroids (such as hydrocortisone or prednisone) is prescribed to those who do not have a bone marrow donor. Most people respond to hormone therapy. But everyone with the disorder will quickly get worse when the medicines are stopped. In most cases, these medicines eventually stop working. People with Fanconi anemia are more likely to develop several types of blood disorders and cancers. These may include leukemia, myelodysplastic syndrome, and cancer of the head, neck, or urinary system. Women with Fanconi anemia who become pregnant should be watched carefully by a specialist. Such women often need transfusions throughout pregnancy. Men with Fanconi anemia have decreased fertility. Families with a history of this condition can have genetic counseling to better understand their risk. Vaccination can reduce certain complications, including pneumococcal pneumonia, hepatitis, and varicella infections. People with Fanconi anemia should avoid cancer-causing substances (carcinogens) and have regular check-ups to screen for cancer.